Welcome to another Creativity Dreamwalk. Today I’m talking with my longtime friend Jill Trepp Sahlstrom. Janet: Jill and I first met in our college days. Friends and creative colleagues we’ve walked through many years together. It’s such a pleasure to have you here on Dreamwalks, Jill. Jill: Thanks. It’s good to be here. Janet: Let’s dive right in. How would you describe your artwork? Jill: As a NW Native I am inspired by the mountains, ocean, and forest. I mainly paint on wood, rather than on canvas. 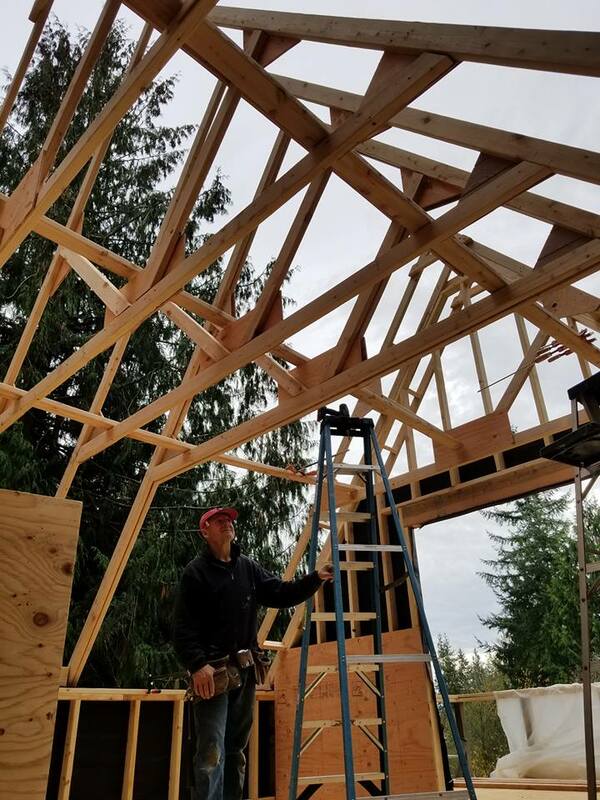 Perhaps this is because of the local lumber mills I see as I drive around or due to the influence of my grandfather, a Swedish immigrant, and carpenter, who built many of the houses throughout Seattle and the house I grew up in. My paintings are also not flat since life isn’t one dimensional. Plywood stands up in the space people inhabit and my wood veneer paintings are “woven” by overlapping and gluing painted strips onto a surface. These symbolize the spiritual dimension of life. Janet: What’s your creative process? Jill: Construction sites feed my wood addiction as I scavenger them for plywood scraps. Once back at my studio on my front porch, I dip my paintbrushes, sometimes two at a time, into the buckets of house paint and apply random brushstrokes as I look at the cedar trees surrounding my house. I feel like a musician playing colors as piano keys. I paint to the beat of classical music not looking at the surface of my paintings. In my college drawing classes, I was trained to observe the lines, shapes, and play of light of what I was drawing. 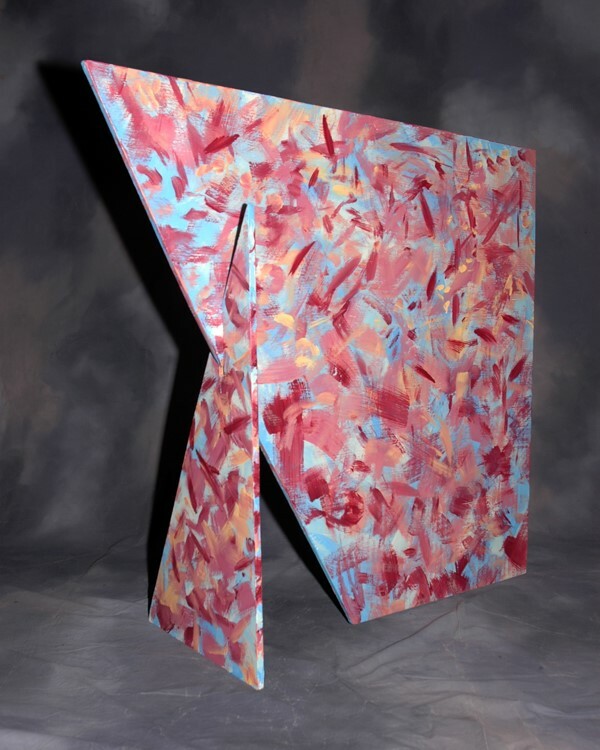 After painting both sides, I paint a matching piece to fit as a base into the larger plywood painting, so it stands up as 3- dimensional painting. 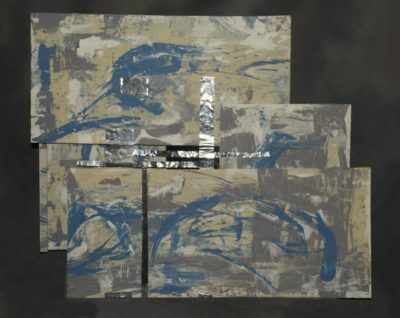 I explore the boundaries of the painting medium by combining materials. Sometimes I mix in painted aluminum to symbolize the non-idealized fabric of society and of multi-culturalism. As a teen, I experienced this overlapping of cultures as I traveled yearly back and forth between my father’s house in a Yupik Eskimo bush town near the Bering Sea and my mother’s suburban house. This experience is the foundation for my mixed media abstract paintings. 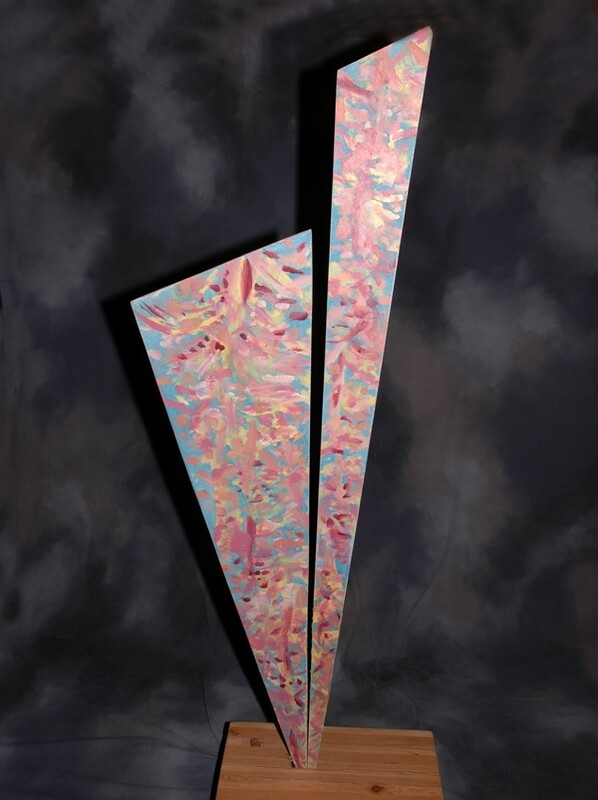 I communicate feelings by applying the Design Elements of lines, shapes, textures, and colors. Current political and environmental themes are often the catalysts that overwhelm me with grief, joy or anger. Painting as an act of prayer allows me to vent this tension between order and chaos. My Christian belief in Jesus as the King of the universe who was born in a barn, suffered in life and death, is an example of the highs and lows of a life. Like Rembrandt who painted the wrinkles on his client’s portrait’s, instead of idealizing them, my art is not meant to be pretty or interior decorations that match the colors of couches. Janet: Great quote! I’m always curious about where visual artists and sculptors work. Can you tell us where you work and how has your workspace changed over the years? What kind of workspace do you have now? Jill: Not until my kids moved out did I have a studio! However, the empty bedroom I use soon filled up with my scrounged art materials to recycle such as pieces of wood, wire, aluminum scraps, beach ropes that washed up, papers, cans of paint. Needless to say, there isn’t any room to create! So, I paint on the deck when the weather is warm enough. Finally, after 20 years of my husband wanting to build a garage and me wanting a studio built instead, I won the debate! 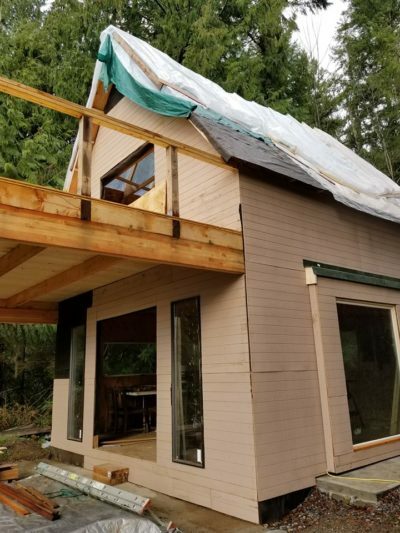 A two story 20 foot by 18-foot studio is halfway built! Next summer I will be able to move all of my supplies in and be able to continue creating through next winter! I hope to offer classes in my studio also. My website will have that information. Janet: Great to see that taking shape, Jill. It helps that Ken’s worked as a carpenter among other jobs he’s had over the years. What are you excited about exploring now? 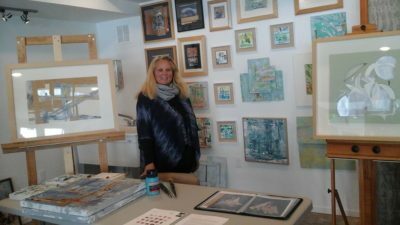 Jill: I am looking forward to creating large projects in my new studio, paintings and sculptures, I am anticipating using the left-over scraps of wood from the studio construction, a four-foot-tall pile under the stairs. I hope to create large relief paintings with these. Jill: I painted this last summer when I learned about children being separated at the border from their parents seeking asylum in the USA. 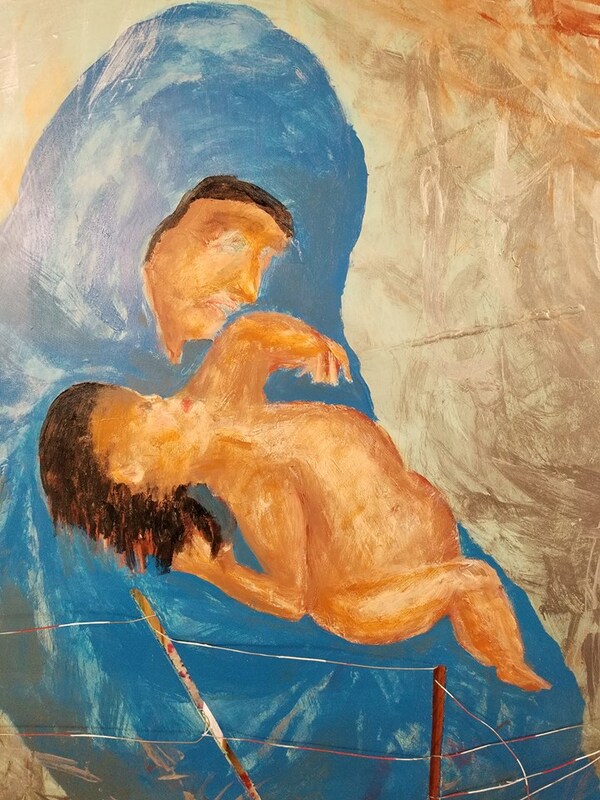 I titled this painting “The Rescue”, as it depicts a nun assisting a baby to escape over the wire fence of the detention camps where children are imprisoned. Last summer 300 parents were deported without their children as part of Trumps zero tolerance policy at the border. Having lost a child myself (from Leukemia) I can feel the anguish these parents are experiencing. Anyone, who has heard a child cry for their mother can relate to how the separated border children feel! 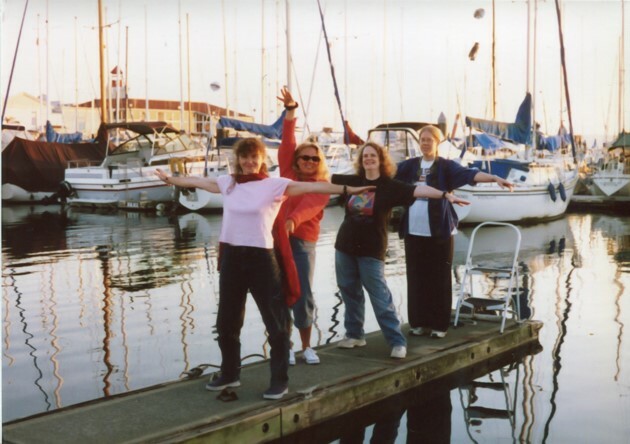 Janet: Our arts discussion group – Artemis – has met regularly for years. How has the group affected your art? Jill: Being a member of Artemis for the past 25 years has given me the courage to continue creating when I was so busy raising 3 children and working half time. We originally met weekly and shared what we had accomplished the previous week or what obstacles we had faced. I usually referred to our meeting as “Artamous” since we follow the same no cross-talk rule as Alcoholics Anonymous, so each member can fully express themselves and be listened to. Not finding much support or understanding from my extended family for my abstract and sometimes ugly “art” our support group of other creatives helped immensely to keep my creative spark burning. I had majored in Art and Education in college and then taught Art in the Seattle School District only to resign following the birth of my third baby. My mother wondered why I didn’t paint more realistic paintings of flowers like I had in college and perhaps people would then purchase prettier pictures than what I was painting. In my mother’s opinion then I would be a “successful” artist. I am so grateful for my fellow creatives in Artemis who believed in my artistic vision even when they didn’t always understand it. Janet: The mutual support of the group has been a boon for all of us. 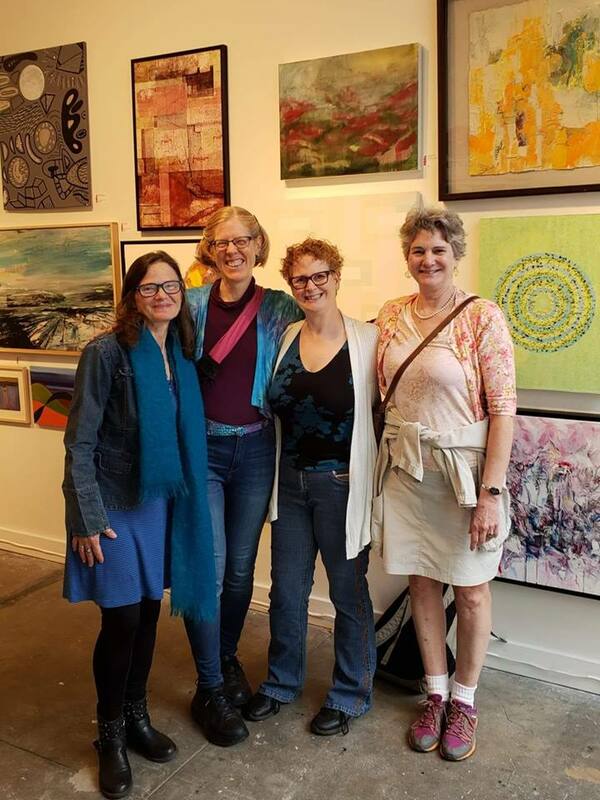 Good to support each other through the many difficulties and it’s magical to celebrate when one of us had a book out or an art show. We’ve been to some of your shows, but can you remind me where you’ve shown? 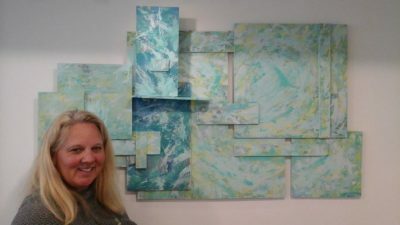 Jill: My woven veneer mixed media paintings have been exhibited in at least one juried show every year for the past 20 years with the NW Collage Society. Some of these exhibits have been at the Bellevue Art Museum, Sequim Museum, Cascadia Edmonds Art Museum, Seattle Convention Center, Rose Hill Center in Mukilteo, the Phinney Ridge Center in Seattle and in various art galleries. I have also exhibited in the Kirkland Artist Studio tours in my sister’s art studio. 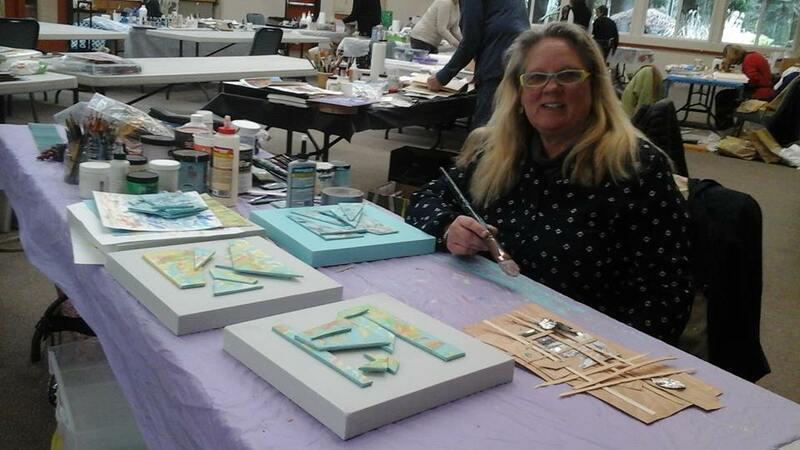 Janet: Thanks for sharing your work with us at Dreamwalks, Jill! 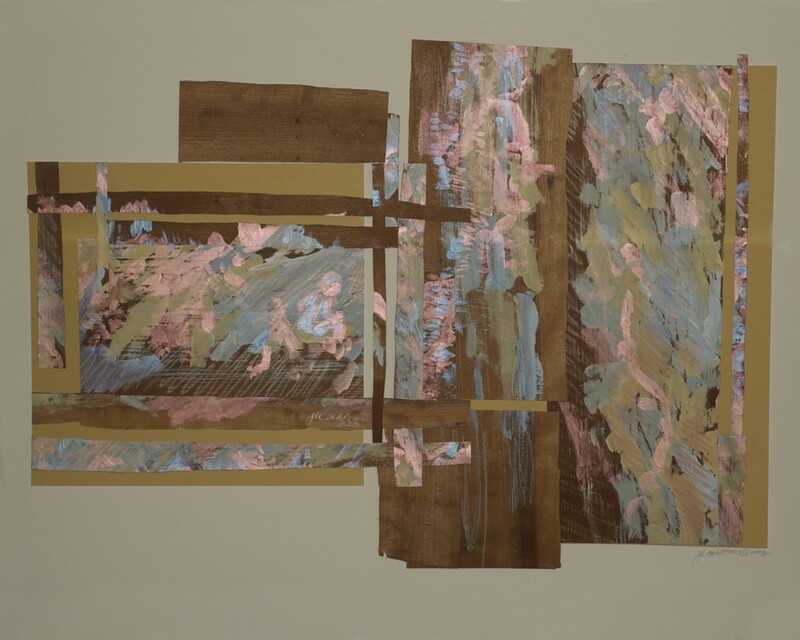 Visit Jill Sahlstrom’s website to view more of her woven veneer paintings. Check back to see what other pieces are posted there later. I loved this interview. Such fabulous artwork from an interesting person. Thank you for posting this piece. So glad you stopped by to hear Jill’s voice and see her artwork. A new ongoing series in Dreamwalks I talk with fellow artists about the magic of the creative process. Honest talks with writers, painters, photographers, sculptors, dancers, actors, musicians, jewelry makers – the works! Come join us. If you would like to pose a topic and share your creative process in Creative Conversations, email me using the contact page on this website. What Do Readers Want to Tell Writers?